Although I do not have children of my own, I can surely count on my friends to exercise my knitting and crochet skills for babies! I love making clothes for babies because they’re cute and small and they’re finished in a jiffy! This dress is made sideways working always on back loops. The chest is made in single crochet (sc) and the skirt in double crochet (dc) separated by 1 half-double crochet (hdc). Row 1: 24 sc, 1 hdc, 30 dc. Ch3 (counts as first dc in next row), turn. Row 2: dc in each dc (30 dc), 1 hdc, sc in each sc (24 sc). Ch1, turn. Row 3: sc in each sc (24 sc), 1 hdc, dc in each dc (30 dc). Ch3, turn. Rows 4 to 80: continue working as rows 2 and 3 until chest measures around 40cm. Join the two sides together and slip stitch down through both sides or sew both sides together. From here on, work on both loops. Row 1: attach yarn at hem of skirt, on the first stitch right after the seam you just made. Work evenly 162 sc around hem of skirt. Slip stitch (ss) on first sc. Do not turn. Rows 2 and 3. : ch1, sc in each sc around. Do not turn. Row 4: work shell stitches around – ch 1, [skip next 2 stitches, 3 dc in next, ch 1, 3 dc in same, skip next 2 stitches, sc in next]*. Repeat * around (27 shells). Row 1: working on right side of dress, attach yarn on the edge of the chest close to the seam. Work evenly 80 sc around. Ss on first sc. Do not turn. Row 2: ch1, sc in each sc around. Do not turn. Row 3: ch1, sc in next 10 sc, ch41 (this will form a strap) sc in the 2nd chain from hook and down the other chains until you reach the chest trim again. Continue working around the chest trim, sc in the next 20 sc and make another strap (chain 40, sc down chains back to trim). Repeat 20 sc around chest trim + strap another 2 times (4 straps made), sc 10, ss in first sc. This will make 4 straps separated by 20 sc each. Tie each 2 straps on either side of dress, making sure the side seam stays at the middle back of dress. Why not complement it with a lovely pair of Mary Jane Baby Shoes? Update: thanks to Debby, who did the translation, this pattern is now also available in German! You can download the German version here. Can’t wait to see all your lovely creations! You may distribute this pattern freely among your friends, you can translate it in your own language, you can use it as material for crafts lessons or crochet groups and you can also sell the finished items. You MAY NOT sell this pattern or a similar pattern with minor alterations that can be considered corrections. 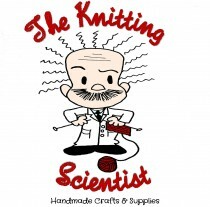 Please credit The Knitting Scientist with a link to this blog. Thank you! I was born in a land where the sun shines bright, time passes by slowly and people take pride in what they do. My mom taught me my first stitches and I never put down my hook and needles again! Later I became a scientist, dwelling within the mysteries of life and the universe, using logic and analytic thinking, giving my humble contribution to human knowledge. Scientist during the day, knitter at night. Just like a super hero, creative hands on an analytic mind is my super power! That's me and this is my story lost among test tubes and balls of yarn! Please, can i adjust this pattern to 12 months, and how? Hi Jane! To adjust the pattern to a bigger size you will need to increase the number of stitches (both single crochet stitches in the chest area and double crochet stitches in the skirt) and also work more rows until the piece is long enough to wrap around the baby. I cannot tell you exactly how much to increase, it really depends on the baby. The best way is to adjust it yourself. I hope this helps! Is there a way to add ruffles? Hey Esie! Sorry for the late reply! Yes, you can add ruffles at the skirt bottom edge. Does this help?